Hello, district info viewers, it is good news for everyone who is running their business online and Offline. We are going to promote your business through online on our website [Districtsinfo.com] free of cost. We are going to promote any kind of business through our website from our promotions you can develop your business and get more leads. Our website has 5 lakhs, viewers, getting organic and social traffic every month. This was the best free promotions for your business. 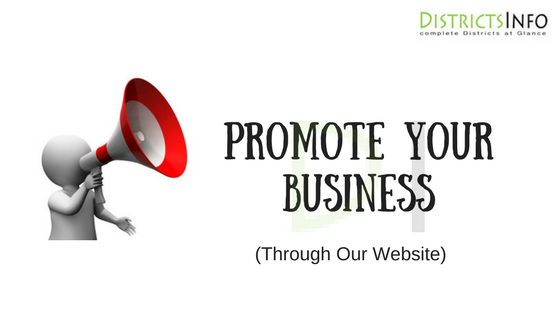 We can promote your business in an easy way to understand every one. Then you can get more leads through online. If your business is offline then nothing to worry we also promote all types of online and offline various types of businesses. Don't send the duplicate content we will verify your content if the content is unique then we will promote your article on our website. After Submitting then we will verify your content if it is unique then we will publish within 24 Hours on our website. You can check it on Facebook Page and Twitter accounts of Districtsinfo.